For general inquiries, sponsorship or collaboration info, please contact me via email below. If you are contacting me about advertising or partnerships, please include as much detail as you can. I love partnering with brands that I like and introducing products I love. If you have a unique marketing opportunity you’d like to discuss, feel free. Please note I only partner with brands that I fundamentally believe in and that I truly believe my readers will enjoy. Items marked with “c/o” indicate that I have received a product courtesy of a brand I have chosen to work with. I will only accept items that I feel reflect my personal style and the aesthetic of Miss Erin Says. All opinions are my own. 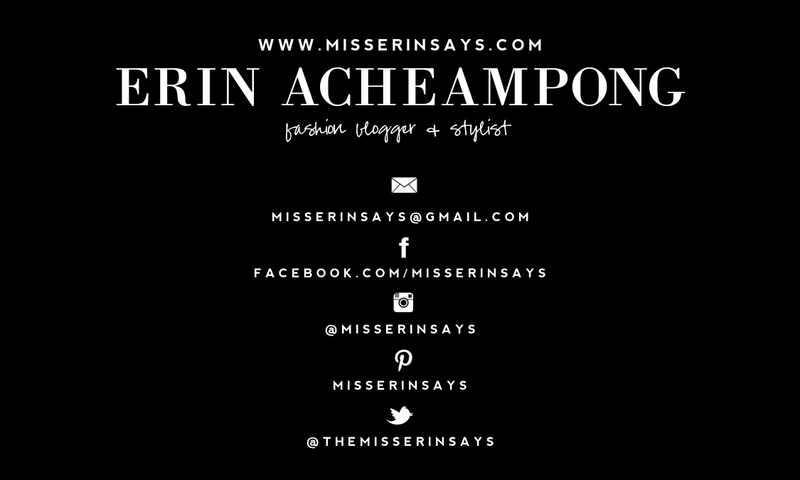 Miss Erin Says uses affiliate links within the site. We allow thrid party companies to serve ads and /or collrect certin ANONYMOUS information when you vist our wesite.These companies may use non-personally identifiable information (e.g. click stream information, browser type, time and date, subject of advertisements clicked or scrolled over) during your visits to this and other Web sites in order to provide advertisements about goods and services likely to be of greater interest to you.These companies typically use a cookie or third party web beacon to collect this information. To learn more about this behavioral advertising practice visit the NAI at http://www.networkadvertising.org. To opt-out of this type of advertising, you can visit http://www.aboutads.info/choices. Disclaimer: Various posts contain affiliate links, if clicked on I receive compensation. All sponsored posts are disclosed as sponsored. All opinions are my own. Design elements custom crafted for Misserinsays.com by The Kinch Life Designs.